Avanti body contours and interior appointments are so striking some design details may go unnoticed. Avanti off-center hood ornaments include the distinctive Studebaker "S" logo badge. An "S" logo badge also appears on the interior door panels. 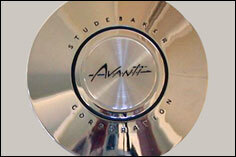 The chrome steering wheel hub shows the Avanti logo ringed by the "Studebaker Corporation" name. 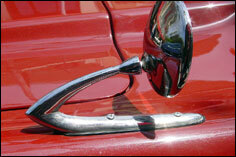 The exterior rear view mirror support mount is sleekly aerodynamic. 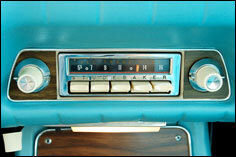 The Studebaker AM/FM stereo radio is mounted below the dash at the front of the center console. Supercharged Avantis include a metal "Supercharged" badge and air conditioned cars show an adhesive decal centered inside the rear window. 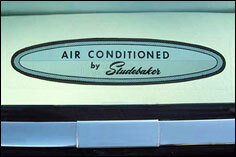 Air Conditioned by Studebaker decal. 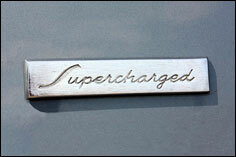 Hood ornament "S" logo badge. Driver's side exterior rear view mirror. 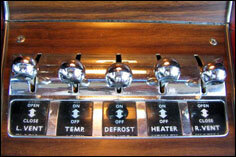 Vent, defrost and heater controls. 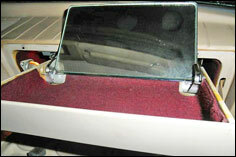 Glove compartment mirror and tray. 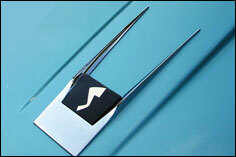 Studebaker "S" logo door panel badge.